What's Actually in Eggnog Anyway? Eggnog and Christmas go together like peanut butter and jelly, wine and cheese, pizza and… well, you get the point. It’s a tasty, and boozy, way to make talking to distant relatives on Christmas day a little easier. But what is eggnog? You can probably deduce from the name that there are eggs somewhere in the recipe, but if you’re buying it from the store rather than whipping it up at home (you’re not Martha Stewart, after all) you probably have no clue what you’re guzzling down. Among the ingredients on most pre-bottled eggnogs are mysterious things like high fructose corn syrup, food starch, guar gum, and carrageenan (who knows). What’s actually in real, homemade eggnog? 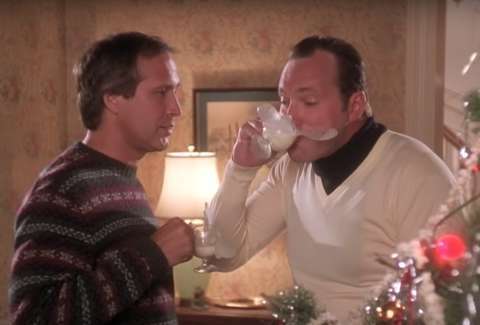 Check it out and prepare to impress all your guests this Christmas, especially the Cousin Eddie of your family. Like we said before, there are definitely eggs in eggnog, but where? Are they cooked? How many eggs do you need? What else goes into it? Here’s what you need to know. How many you’ll need may vary, but typically a good eggnog calls for about four yolks per quart. They’re left raw, but fear not: your risk of getting salmonella is low, according to a report by Popular Science, at least as long as your eggnog is made at least a few days in advance. Microbiologists at Rockefeller University’s Laboratory of Bacterial Pathogenesis and Immunology have a tradition of whipping up a batch before Thanksgiving, aging it for about a month and then serving it at a holiday party that December (Science!). If it’s good enough for a bunch of scientists, it’s surely good enough for your family. Not all eggnog recipes call for egg whites, but it’s one way to use the whites you separated from the yolks and it’ll stretch every batch a little further. Again, recipes vary based on sweetness preferences but about ¾ cup should do it. George Washington, who was apparently a connoisseur of the stuff, made his with about that much sugar, while Martha Stewart’s recipe calls for way more. Feel free to follow whichever famous historical or public figure’s eggnog recipe tickles your fancy. There’s really no getting around this one. Whole milk is an important part of any eggnog recipe, so please don’t try to swap it out for skim or two percent. Again, this is important. Most eggnog recipes call for about two parts whole milk and one part heavy cream. How much is a part? We don’t know, we’re just relaying information here. This is the part of the eggnog recipe where you can get a little creative. If you’re boozing up your eggnog, you can use whatever kind of cognac, rum, rye whiskey, sherry, or bourbon you personally prefer. Some recipes call for more, while others are a little lighter on the booze. Use your discretion… and maybe take away your guests keys. Eggnog typically contains grated nutmeg, but some may call for cinnamon, vanilla or some combination of the three. You can do whatever you want here and pretty much guarantee it’s going to be delicious. Although eggnog may seem like the least vegan friendly holiday drink, there are a number of ways to put this together without using eggs or dairy. Feel free to give it a try.